Merry Christmas and a Happy new Year to you all......that is if anyone is still reading my blog after my absence. I certainly didn't mean to take a break and then for it to be for soooooo long. I wanted to share some projects with you and fill you in on what has been happening around here. First thing to tell you about is Mr O's 6th birthday. We had a brilliant time in QLD and Oliver absolutely loved having his birthday at Movie World. The ONEride he wanted to go on was the Scooby Doo Rollercoaster! So, while I stayed with Miss M, daddy took Oliver on the ride. M and I waited at the exit and inside the shop there were monitors showing the photos that were taken during the ride. I kept watching and watching and watching and thought maybe Oliver changed his mind about going on the ride! I was about to leave when I saw Oliver's face! Oh my.....he was not impressed at all. LOL. I couldn't help laugh because I knew what was coming. He did not want to go on THAT ride again - it freaked him out!!!! The rest of December was taken up with school activities and his Christmas concert. My in laws arrived from the UK on the 18th December and were here for 3 weeks. I knew in that time I probably wouldn't be posting. They were lucky to leave the UK as the airports opened for a few days which was when their flight was. We spent Christmas at my parent's house and had a beautiful lunch. It was a very warm day too and luckily "Santa" bought a small pool for the kids. A couple of inches of water was all that was needed and Miss M in her bikini (LOL). They splashed about and had a ball. We spent 3 days in Lake Macquarie for New Year's. A nice few days away to somewhere we haven't been before. Well, that is it for now. I will set up some posts to show you my projects. Thank you for reading my blog and please, do leave comments - I love to read them. I wanted to pop on here quickly to wish you all a very Merry Christmas! Last night Oliver left some goodies for Santa and his reindeer! We have had a lovely day with Oliver opening up everyone's presents for them. Here he is with his new Thomas The Tank Engine play set. I hope that you all had a wonderful day with your family and friends. Although we couldn't find the star, Rob had an idea for an angel! Yes, it is Emily!! ROFLOL. Oliver then wanted to be the angel - no way could lift him and hold him like Emily! Here he is turning on the lights. You might be able to see that the baubles aren't quite evenly spaced so me just being me, have had to add more baubles and moved a few around! I went out and bought a new star after these photos were taken and then I found the 'old' star so I may use that next year. Do you do colour themes? Last year it was red and gold, this year as you can see from the tree it is only gold and next year I am thinking of black and white. I still love the traditional christmas colours but I also like something different every now and then. LOL. Still more cards from the "INKlings" team weekend away. This great card is designed by Sharon Boyd. How cute is the penguin poking out from the DSP! Ink: Riding Hodd Red, Whisper White. Paper: Riding Hood Red, Old Olive, Chocolate Chip, Ski Slope DSP, Whisper White, . 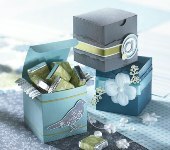 Accessories: Scallop Edge Punch, Silver Brad, 1/4" Old Olive Grosgrain Ribbon. Yes, the title is my question to you! I am normally a very traditional coloured person for Christmas but for some reason, I wanted to be different this year. Anyway, back to my card! After putting this together, I'm now thinking that instead of the lighter blue (Brocade Blue) layered on top of the base card stock (Brilliant Blue), I could use white and then the blue ribbon would stand out more. My husband suggested using a 'red' ribbon instead? Hmm, not sure. Tell me what you think or if you would do something else. Well, I must have been good this year as look what Santa gave me !! Lots of SU! goodies. I have had a little play today with my Bold Butterfly set as I really love that one. 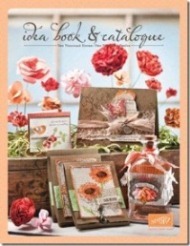 My friend Karen (using this stamp set) made cards with matching card box - have a look HERE. The colours she used are fab ! My order was not complete as I ordered the Jumbo Spot On Wheel but got this set instead !! I also received the wrong colour ribbon but that is no big deal. Do you know, after all the Christmas cards I made, I forgot to make one for my husband. I had to quickly make this tonight, while I was clearing away all my craft stuff as I use our dining table to craft on. I did a treat box a while ago and thought it would be nice to do a Christmas one. I again used my Basic Grey papers - how I love BG. This is the view from above - now all I have to do is fill it up with goodies. Here is the side view and I added some Bazzil flowers and white eyelets. I don't think I will do anymore to it other wise the wonderful paper will be lost. I had to get the tree in the back ground. I opened up my post today and this beautiful handmade card from my friend Karen in Queensland arrived - Thank you Karen. What a lovely bright & cheery christmas card to receive. It certainly makes the day brighter considering it gets dark by 4pm here in the UK. I hope Karen receives my card very soon. Here is my Christmas card and envelope. I hope you can see the red glitter on the retro snowflake on the card. I stamped it in black in first then I decided to add the glitter. It does look better in the flesh than on here. I hope family and friends like it when it arrives in the post. Paper: Bazzill cardstock, Basic Grey (Fruitcake - Nutcracker/Pine). Accessories: Red Organza Ribbon, White Gel Pen, Red Glitter, Nestabilities. YAY !!!! After all the rain the UK has had this week, today the sun is out and after dropping Oliver off at nursery, I finally got to send ALL my christmas cards. I have 6 countries to send to - Australia (naturally), UK, New Zealand, Canada, Mexico & Germany. Now all I have to do it hand deliver a few to neighbours and friends. Next thing on my list is present shopping - no I haven't done that yet !! OMG! I am meeting a friend next Tuesday to do some shopping. I am hoping to get it done in ONE day - wish me luck. I am busy today finishing off my christmas cards. I decided I would stamp the envelopes so after completing the inserts, that is exactly what I did. I only have about 1/3 to go and then I can send out my cards. Yipppeeee !! I will take a photo of the completed card and envelope and post it after the cards have been sent - I know, you want to see now !! Sorry.